Despite millions invested in it, Customer Relationship Marketing (CRM) does not seem to deliver the benefits that it promised, and may, after all, be a failure. Why has it failed? Lets see why none of these assumptions has proved to be correct. People buy products because they decide that owning the product or service at a particular time will make them happier than not owning it. What happiness consists of is defined by the person who is trying to possess it, and varies from person to person, and from time to time. I like Big Macs, but not all the time. Sometimes I like fish, sometimes chicken, and quite often I like home cooked vegetables. There is no way that you can accurately predict what I want to eat next, unless you know what I ate last, how hungry I am, where I am at the time, who I am with, how much money and time I have available right now for eating. There is no way that any data warehouse could ever collect such timely and relevant information, or that someone besides the customer himself could accurately weigh the importance of each fact. Besides my eating habits, the same principle applies to predicting my interest in taking a trip, buying clothing, buying a car or an appliance, or taking a college course. You can collect some relevant information, but you cannot collect enough to make accurate predictions concerning Arthur Hughes today. What you can do with some accuracy, is to say that people in a segment containing Arthur Hughes are likely to buy some product in the next few months. But of course, that is not CRM, or one to one marketing. That is regular database marketing where you are targeting segments. What is the difference between Database Marketing and CRM? They are both based on databases of prospects and customers, which are used to guide marketing and sales strategy. CRM requires a large data warehouse with costly software, aimed at determining and influencing the behavior of individuals through one to one marketing. 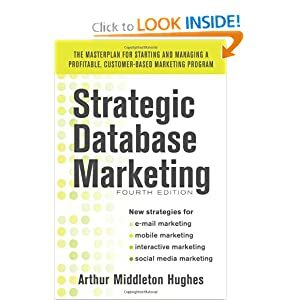 Database Marketing is based on a data mart, which costs about 10% of that required for a CRM warehouse. Database marketing is usually aimed at identifying customer segments and marketing to them, plus building one-to-one relationships with existing customers through loyalty building communications. The second assumption is wrong for a similar reason. Do you eat because you are hungry, or because you received a timely communication telling you that a particular restaurant was having a special on lobster dinners? Of course, if you are hungry, enjoy lobster, and have the time and money to go to that restaurant right now, the offer would be a wonderful blessing. But the warehouse cannot contain that information. Mass marketing on TV showing people eating delicious lobster dinners at a low price can work wonderfully. Of course there are situations in which a timely and relevant offer can make the difference in a sale. Banks can predict the probability of a particular customer buying a particular product. Automobile companies know when your three-year lease is up. But for these situations, good old database marketing will work just fine. It is almost impossible for most companies to become customer focused. Why not? Because of the way business is developed. You create a new camera, new computer, new automobile, or a new hotel. The company that develops the product wants to realize a return on their investment. They put a product manager in charge of the marketing of it, and tell her to get busy. She does everything she can think of: mass marketing, point of purchase displays, retailer subsidies, direct marketing.. Her goal is to sell hotel space in this new hotel, and only secondarily to increase overall company customer lifetime value. In a later article I will explain why the economics of CRM does not work out.